Dynamic sites are developed by the Web Development Companies in Coimbatore and are more expensive in the initial phases of development. The advantages of the dynamic site are numerous. In the start the site allows the owner to add the new content and simply update the site. In these sites, the events and the news are easily posted and updated because they are given that simple and easy browser interface. The features that are used in such sites can only be stopped and limited by the imagination. Some of the examples of the dynamic site are e-commerce system, discussion board, add information to the website, CMS (Content Management System) and much more. 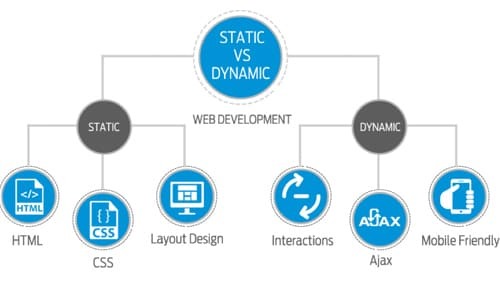 The dynamic website design is more fixed as compared to the static website. The dynamic website is designed by the professionals and required the cost to develop. At the initial level, the dynamic development cost looks like more expensive as compared to the static one. Not only the development cost of the dynamic website is high but the hosting of such websites is charged more from the customers. Our Professional web designing team understands your business, and develops a web design and development strategy. Develops website with unique and professional web designs which attracts your business customers and increases the website visibility online.